Finally. Fall has really arrived. The weather has cooled off and believe it or not, the leaves are starting to fall from the trees. I’ve got some fall dining room decor to share today and I kept things simple. I added pops of gold and orange to other rooms but not in the dining room. It’s all natural elements and simple, neutral colors. Boxwood, dried hydrangeas, cotton bolls and drop cloth. I’m also joining the Fall bHome Tour so I’ve got all that information waiting for you at the end of the post. I decided to go all neutral in the dining room when I spotted these drop cloth pumpkins from Cloth and Patina on Instagram. I don’t often fall in love at first sight, but for some reason I did when I saw these pumpkins. I think they are simply adorable. I headed straight over to Etsy and before the afternoon was over, my order was placed. It was definitely an impulse buy but I absolutely love them. When they arrived in the mail, it was just like Christmas. I dug out one of my boxwood garlands, to tie in with the wreath, from a Christmas bin in the basement. I nestled the pumpkins on either side of the garland and the centerpiece was finished. It literally took less than 15 minutes. I have plenty of dried hydrangea blooms so I filled an old enamelware pitcher and placed it on the side table. Every fall I try to come up with something different for the dining room centerpiece…and every fall I wonder if I can pull it off. I really do love this one and it was honestly the easiest thing to do. Even if you don’t have a dining room, something like this could be used on a sofa table or coffee table. I’ve got more fall decor to come this weekend so stay tuned for that. As always, thank you for spending a few minutes of your time with me today. Visit the other bHome Bloggers today. 30 in all by the end of the week ! « 100 Stencil Ideas | Decor, Crafts and More! Pinned. Thank you so much for the giveaway! 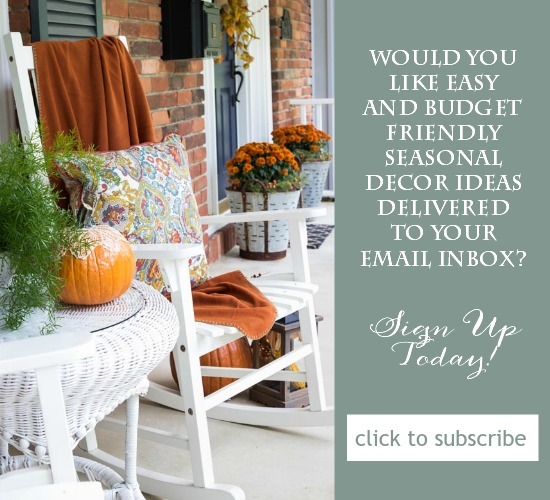 I love getting your emails and all of your decorating ideas! pinned the paint saint to my craft projects board. 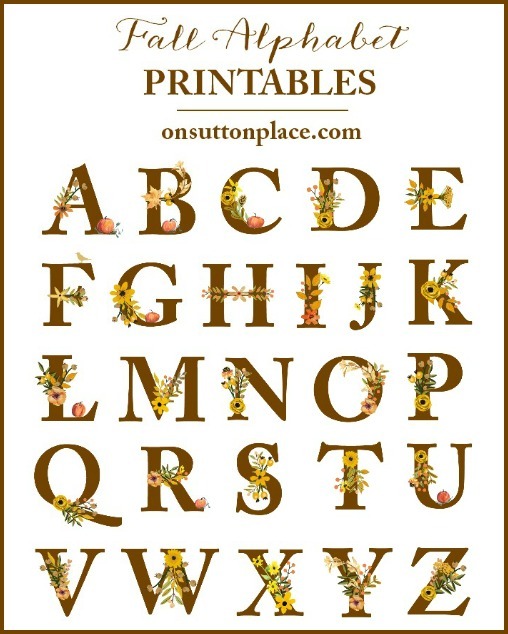 Love your fall table loving the neutrals, your fall letters are awesome. I just ordered 3 of the Paint Saint product and am anxious for them to arrive! I have touch-up spots that I’ve been dreading but this looks like a fantastic product for those spots that often need a fix. I LOVE your Fall decorating ideas. Your tips are always so attractive and look homey and comfortable. I try to duplicate many of your ideas with what I already have using your wonderful tips and a few new items that you recommend. Thank you! I pinned “the paint saint” also :) good luck everyone! I pinned “the paint saint” to my board clever ideas and organization. I love your decorating style and inspiration. Beautiful Ann. I really enjoyed looking again and again. Thanks for sharing. Love the pumpkins and the whole room! Thanks for the giveaway, I pinned! Just returned to the US from a few months abroad. Love the neutrals and I pinned the image. Hopefully I’ll get to do some painting projects before the holidays arrive. Love this tablescape! The bright touches of gold & Amber glasses adds to the neutral setting. I pinned My Paint Saint!!! I’m the painting fool at my home! Loved the pumpkins. 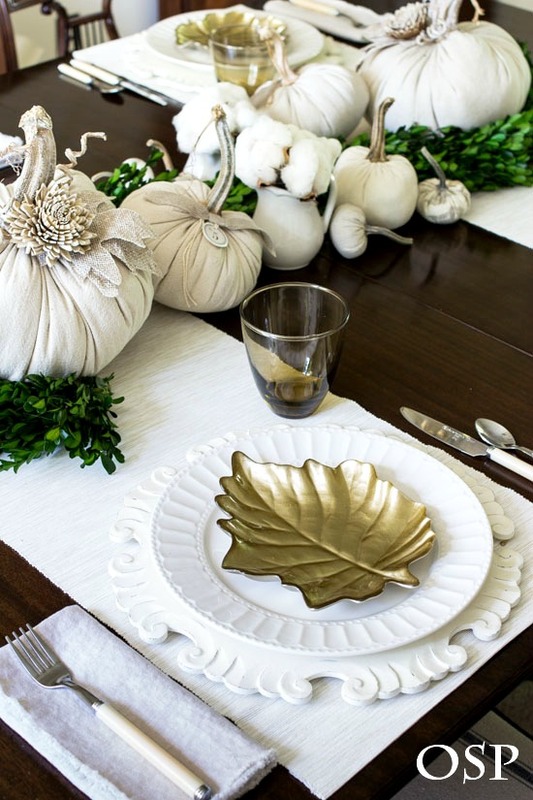 The neutral palette looks so nice, especially with the leaf plates. I like the touches of the fabric pumpkins that add texture. Super cute pumpkins, Ann. I don’t blame you for purchasing them. I say buy what you love! 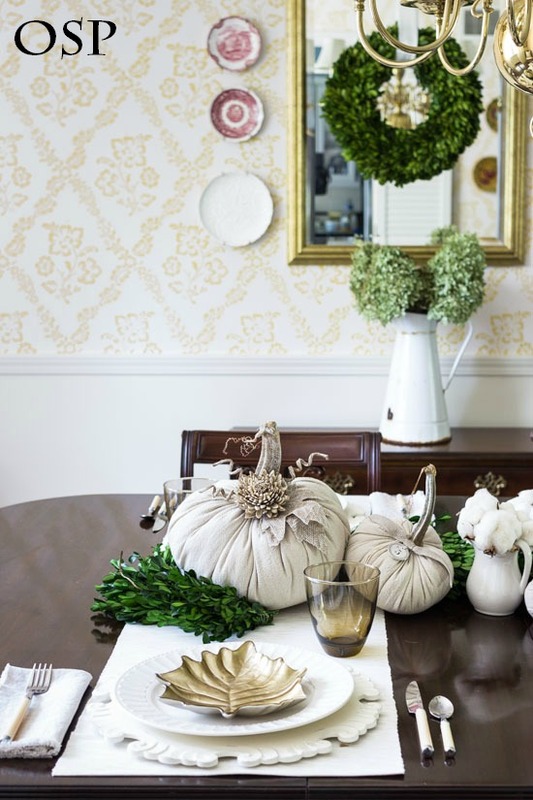 Love those pumpkins and your dining room, thanks for the giveaway! Oh my goodness!!!! I got so carried away prattling on about my Christmas decor, I forgot to tell you I indeed pinned “My Paint Saint” to my diy board. We have 5 young grandchildren, all under 10, who spend a LOT of time with us. Four boys and one girl. We are constantly digging out paint cans to do our every two months touch ups on walls, baseboards and doors. Cars and trucks can fairly fly around here when the boys get wound up. This sounds like a dream! When I saw the clever name, “My Paint Saint”, I thought to myself it could soon become “My Patron Saint”!!! Thanks for the giveaway Ann! After seeing your GORGEOUS fall decorations, I think it’s not to early too change out most of my burgundy and gold for some beautiful neutral and natural. You have an incredible gift, Ann. Everything you design is always so beautiful and inviting. I pinned the Paint Saint but I didn’t know how to link it. Am very interested in trying the Paint Saint. Your fall decorating is simply beautiful and such a great inspiration for me. This is just what I’ve been looking for! Safely pinned for future reference! For years I’ve kept in jars of touch-up paint – messy little jars. Good to know there’s a neater way to save paint. Well I pinned the Paint Saint!! But I don’t know how to “link” it. 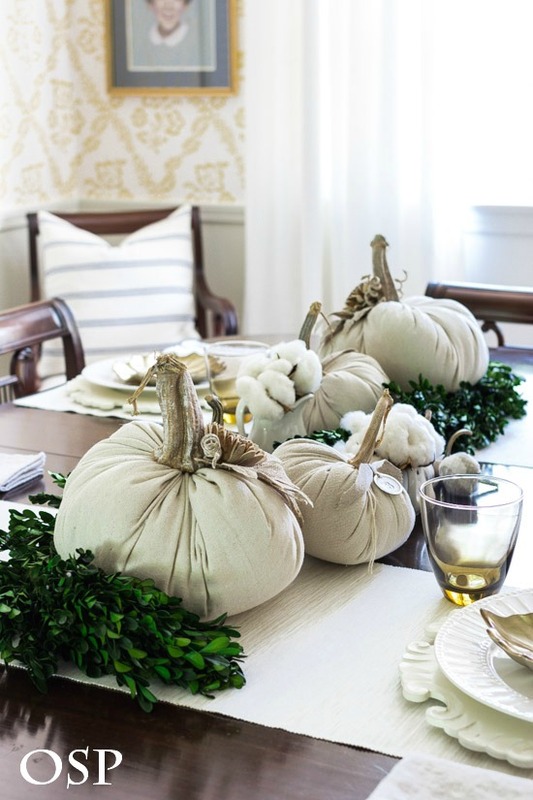 I ABSOLUTELY LOVE those drop cloth pumpkins, oh my! And those leaf dessert plates are to die for! On my way to check that all out and get myself some! You have great taste and I enjoy your blog to no end! Thanks for sharing all these wonderful finds. Love all your ideas and tips! Where do you get your boxwood wreaths? I love all your pumpkins Ann!! The is so pretty! I pinned it to my Home Color palettes & paint board. Thank you! Pinned to my Fall Decorating Ideas board! So classy looking!! I can’t wait to make those pumpkin center pieces. Very clever and a great upcycle idea. Really like your table and the cotton,wow!! I grew up on a cotton farm, what a great idea. Thanks for sharing.???????? Oh my goodness, those drop cloth pumpkins are the cutest things! If I didn’t just just make a bunch of sweater ones, I might have stolen this idea. They make a beautiful centerpiece in your gorgeous dining room! Lovely centerpiece! I love the peacefulness of neutral decor and decorate my home the same way. The fabric pumpkins are adorable! Thank you for the inspiration! I did pin the Paint Saint as well as your lovely decor. Have a wonderful day! Looks really great, i think i like the neutral colors better this year,and you did a great job. Thanks and have a wonderful day. Ann, dear, My computer would not save to Pinterest, so I saved it to my Evernote account. Hope that counts! Best wishes on your new internet endeavor. So far I have only been in touch with you through Bloglovin’. I’m going to sign up with my email address so I don’t miss anything! Oh my gosh! Those are real pumpkin stems, aren’t they? 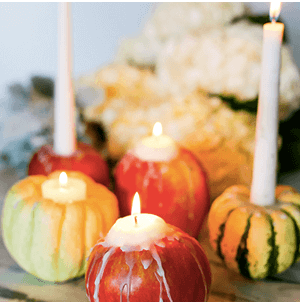 I absolutely love those pumpkins, too, and they are perfect on your dining table! And I pinned the graphic!!! I pinned My Paint Saint. I just love all your ideas. So pretty. After trial and error my brain kicked in to pin. Ann, I believe you’ve out done yourself this year. I absolutely love your table setting but alas the pumpkins are gone. Better luck later. I pinned the Paint Saint. Thanks! Gorgeous Fall Tablescape ♥♥♥ Love boxwoods! I love your projects! Can’t wait to try them. And I pinned the Paint Saint link! It’s pinned and what a great idea! Also love your dining room table. I loved this entire post. I wanted everything I saw. I did purchase the set of 3 canvas pumpkins, on Etsy, but must go back and tell her how I was referred to her shop. I did pin the Paint Saint, which I really need right this minute. I think I will order 2of them. Just had new thermostat installed and need to touch up wall paint as this is so much smaller. Link above is posted on my “pallets” board on Pinterest. I am older and too old to redo my house in farm house style. Pinned! Love your fall dining room! Your dining room is so beautiful! Thank you so much again for choosing my pumpkins to be a part of your Fall decor! I love so much the simple elegance of the dropcloth with the greenery! It is gorgeous! 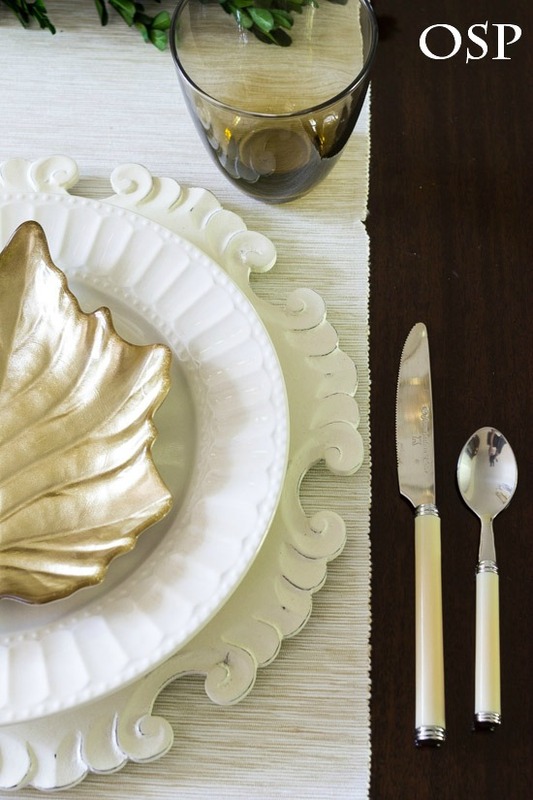 The white place settings with the gold leaf are perfect and beautiful! I feel so very honored and blessed to be a part of your home. I pinned! Please save me from my messy side!! A brilliant idea!! Love My Paint Saints! Pinned. Loved the table! I really love those pumpkins! I may have to get some too. I like the use of boxwood for fall. Always good to reuse things in an new way. I pinned. When ever I look at your beautiful home, which has a similar floor plan to my house, I wonder how big your room is. I love your dining room and the furniture, but I wonder if I could pull it off in my dining room. Would you mind telling me the dimensions of your room? Hi Debbie! The dining room is 13 ft by 11 ft. So it’s really not very big. The table is 50 inches wide which doesn’t leave much room to walk around it. We inherited the table though so had to make it work. It’s cozy for sure! I think what happened was that the pumpkins sold out. I believe Tammy has listed them again so maybe check back? Here is the link: http://rstyle.me/n/b2ggcmb4svx. (aff. link) If what you want is not listed, just send Tammy a message and I’m sure she can make you something. Thank you! Pinned it to DIY – neat product. Loved your fall decorations, thanks! I pinned the link. Hope I win! Ann, your dining room table looks so beautiful. You have a talent for combining elements to create an interesting, fresh look every time. 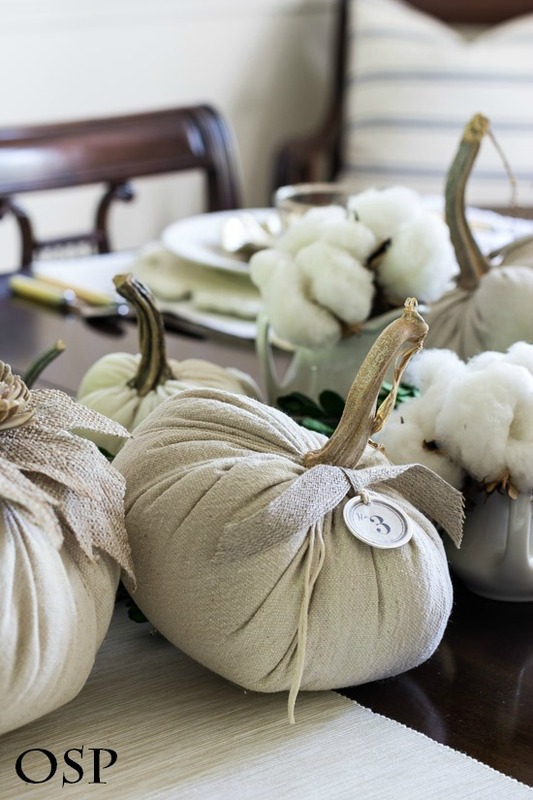 Your drop cloth pumpkins are showstoppers, love those! Thank you for the inspiration, I’m so happy to be on this Fall Home Tour with you. Happy Fall! Pinned it to my DIY & crafts board. Also cked it out on Amazon. Love your blog! 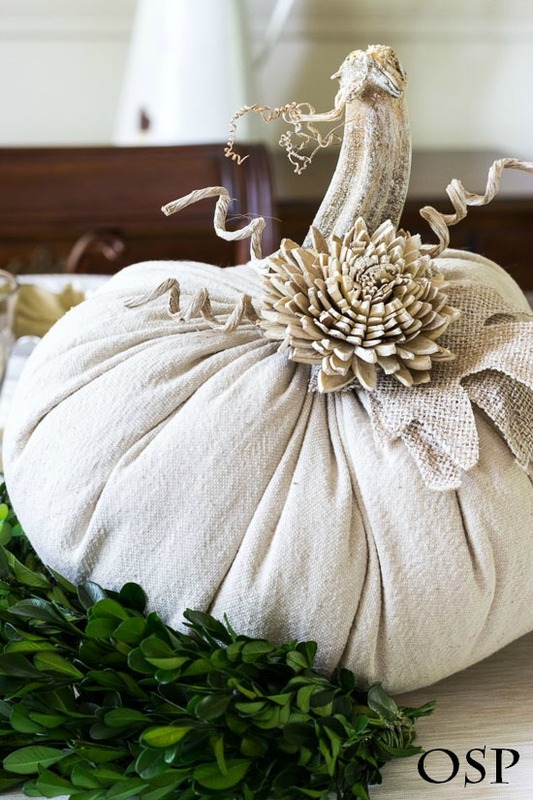 Love your drop cloth pumpkins and the colorway is so elegant. Must have those dessert plates. I was just thinking the other day how the colors for Halloween and Christmas have changed so much for the originals that we associate with our childhood or when our children were young. I pinned this to my Pinterest at https://www.pinterest.com/pin/206673070379862190/. I pinned on my “good to know” board! Love your stuff. Ann! Your table is gorgeous! I love those pumpkins. I normally try to stay away from looking too much at Etsy, but I think I’ll head over and have a look. :) Love the neutral look you have going. The leaves are beautiful, too. Perfection!! I pinned! Loved today’s blog! Very elegant. Pinned the Paint Saint! Thanks for a give away! I love these pumpkins, too. I had made velvet ones last year and they are already on my dining table as well. I love the boxwood combined with the drop cloth pumpkins! Pinned the paint to “Clean it up” Board. Natural elements work best for me, too! Those drop cloth pumpkins are gorgeous Ann!!! !….I must go to that site and check it all out!…the pumpkins are a showstopper on your beautiful table. Love the detail that has been added to them….Your dining room dressed for Fall is so beautiful Ann…I see some leaves of our leaves starting to fall…much to my hubby’s dismay!!! Happy Fall Ann!! Ann, your table is just beautiful! There’s something so elegant about a tonal neutral palette, particularly one revolving around creamy whites. I can see why you love the drop cloth pumpkins. They’re wonderful!! I pinned My Paint Saint to my Pinterest board, Decor Ideas. Love your designs! How did I not know about this product, My Paint Saint? I followed the link and was pleasantly surprised when I read about this on Amazon, looks like a real time saver, perfect for me! I pinned this on Pinterest. Love the calm, neutral fall decor you shared, beautiful! My Paint Saint is a sponsor of the bHome App where I am a contributor. Glad you like it! Love Love Love the drop cloth pumpkins but went to her website to buy she was out, your impulse buy worked!! My husband just brought home a bunch of pumpkins for the deer for camp, so I’m going to menards to buy drop cloths and take the stems off a bunch of pumpkins and make my own! Thanks for the idea!!! Pinned! Love this neutral look. Those pumpkins are divine! I love the pumpkins and the deep green of the boxwood together. Your dining room looks a bit different, new chair covers and drapes? I’m happy the weather is feeling like Fall for you:). Hi Kathleen! Nope…nothing is different but I’m glad it looked new and fresh to you! Love, love, love the texture of your new leaf plates with the texture of the carved chargers! 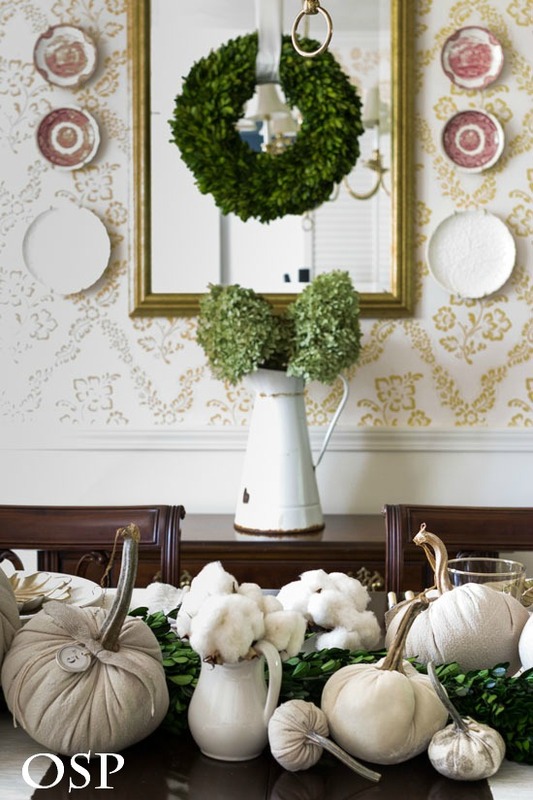 Your Christmas greenery adds a nice pop of color to the table and mirror. I never would have considered vases of natural cotton but they compliment your new fabric pumpkins beautifully. Will you have a pumpkin ice box cake as one of your Thanksgiving desserts? ???? I pinned the Paint Saint pic! I would love to win the gift card but if I don’t I am still winning with all your great ideas!! Thanks for sharing such easy to follow ideas! Love those pumpkins. Do you know manufacturer and name of the wallpaper pattern? 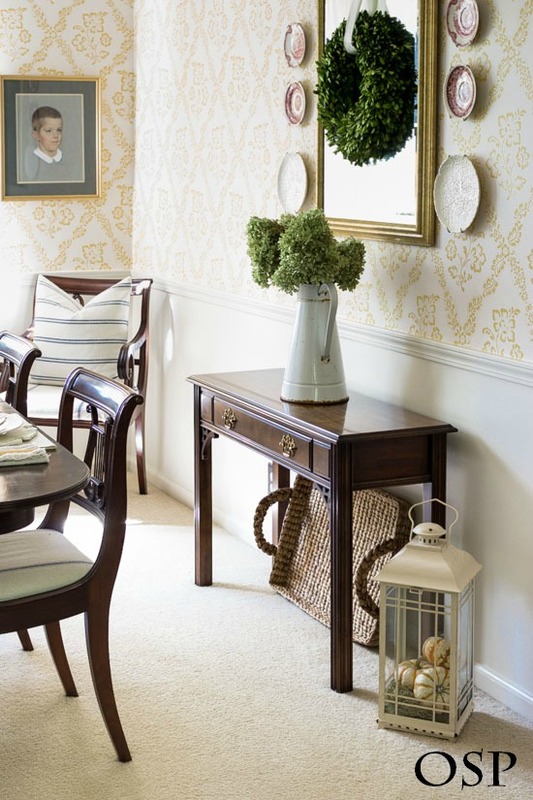 Hi Mary…the wallpaper is Waverly and it was from a book called Williamsburg. I have tried to find a source for other readers but I’m afraid it’s no longer being made. I have not been able to find it anywhere. Sorry to disappoint! You certainly have a way with fabric. Love it! What a great product! Pinned it! This would be a life saver! Pinned. I can see why you fell in love with those pumpkins Ann, they are adorable!! Sometimes you just have to follow your heart… and buy that thing that sings to you! 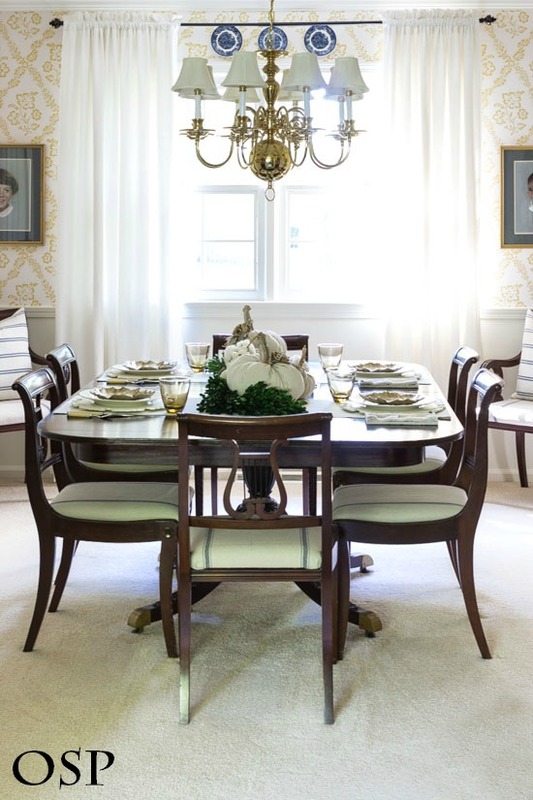 Your dining room is lovely dressed in neutrals for the new season. Enjoy!! Need Paint Saint! Thanks for telling us about it. Pinned. Heaven help us, My Paint Saint! Ann you have such a great eye!! The dinning room centerpiece came together so nicely. I am seeing a lot of neutral fall decor this year and I’m really enjoying it. Have a wonderful day!